April 2012 marked National Organ Donor Month in the U.S. While there were many ceremonies for donor families, celebrations of life for recipients, and declarations made across states, the most notable activity was the announcement of Facebook’s feature to indicate you are an organ donor. While the new “Health & Wellness” indicator on your Facebook timeline does not actually register you to become an organ donor, it is a public (or friends-only) pledge and acknowledgment of your intention to do so. Facebook does provide links to Donate Life, which in turn links you to your state registry. Signing up to become an organ donor is still a fragmented process. How you can sign up (online, by mail, in person) differs state by state. When you move states, you’ll need to re-register. When you renew your driver’s license, you may need to re-register too. And, you still need to make your intentions clear to your family. How are we going to streamline this process and make it easier? How can I indicate in one place that I want to be an organ donor and have this be legal consent and easily accessible information no matter where I am living or traveling? I guess the real question is, how do we harness this building consent and awareness into ongoing momentum to save lives? Organ Donor for Life is gearing up for a busy 2012! Below is a quick snapshot of some key dates and activities. We’ll be making some exciting announcements soon about our key races for the 2012 campaign – and how you can be a part of the Lifesaver Team! On Sunday, July 10, 2011, we officially kicked off the Organ Donor 4 Life campaign at the Pine Bush Triathlon in Albany, NY. My dad and I participated in the race as a relay team. I swam, dad cycled and we did the run together. It was a perfect warm sunny day and we were lucky to have a great cheering squad. The swim and bike ride went by quickly for each of us. We tackled the run together, with a good mix of walking and jogging. Each time my dad set a target for how far he would run, he ran a little further. With that mindset and willingness to push himself, I can definitely see my dad conquering a long distance bike ride in the future. In fact, a celebration ride from Albany to Boston may just be one of the next activities for the campaign. Quite a difference to be able to even consider cycling 170+ miles when 15 years ago that trip must have seemed like the longest ambulance ride ever. Did you know that only 38% of Americans are organ donors? And the gap between people in need of organ transplants and the number of available donors gets wider each day? We certainly don’t make it easy to become a donor in the US. You can really only register at DMV. Only a few states allow you to register online. There’s no national organ donor list. Barely anyone offers education on what it means to be a donor – and what it means to receive an organ. My father and I are ready to change this. We are ready to share our story of how an organ donor saved my father’s life 15 years ago. 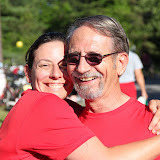 By participating in his first triathlon on Sunday, July 10, 2011 my Dad wants to show you how fulfilling life post-heart transplant can be. We want to encourage you to become an organ donor AND join our campaign to increase the organ donation rate across the US. Sign our pledge to Become a LifeSaver. That’s how many states have organ donation education at DMV. How many states have registries that are linked to those who sign up to become organ donors at DMV? 52 of 52. Seems clear to me – education is sorely needed to increase the organ donation rate in the US. To see where your state stacks up with education about organ donation and what their policies are, check out this interactive map and chart.